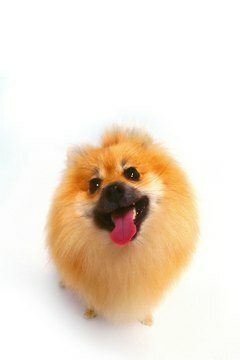 Excessive panting is one symptom of heatstroke in a Pommie. Since dogs don't sweat, your fuzzy little Pomeranian keeps her cool by panting. It's not the most effective means of temperature management, especially during warmer seasons and in hot climates. Those conditions, coupled with your Pommie's mass of thick fur, put her at risk for heatstroke. Pomeranians originated in literally Arctic climates. They were bred to be working dogs in such frigid regions as Lapland and Iceland, and most of the work was done outdoors. Because Pomeranians hunted, herded, pulled sleds and kept watch, the dense double coat they developed served them well. Your furry friend still sports the same thick, insulating coat today, making her better suited for colder weather than for hot temperatures and prone to heatstroke if she doesn't stay cool. When your Pomeranian exercises too rigorously or is subjected to high temperatures, the odds of her succumbing to heatstroke go up. Panting alone is no cause for alarm, but watch your Pom for accompanying signs of heat distress like weakness or collapse, excessively drool containing a thick saliva, bright red gums and tongue -- although the gums may also appear purple or blue -- and vomiting and diarrhea. Your Pomeranian's normal body temperature should be around 101 degrees Fahrenheit. Just a 4-degree difference can push her body into a heatstroke, so watch for body temperatures of 105 to 110. Once your Pomeranian's temperature tops 105 degrees, shock can set in quickly so your swift reaction to heatstroke is vital to her survival. You can lower her body temperature by wetting her with cool -- but not cold -- water. Ways to do this include submersing her to her chest in cool water, misting her coat with cool water or wrapping her in a damp towel. Put a fan in front of her to blow cool air on her and wrap an ice pack in a dry towel or washcloth and put it on her lower abdomen, in the groin area. If she is conscious, give her ice chips or even cool water if she'll take it, but don't allow her to drink too much too fast, as that can cause vomiting. Even once her temperature has started to drop, it's still necessary to get her to the vet to be treated for shock and dehydration. The most effective way to deal with heatstroke is to avoid it in the first place. Don't ever leave your Pomeranian in the car when the outside temperature is hot or even just moderate. The inside of a car can heat up fast -- as quickly as 20 degrees in the first 10 minutes and roughly another degree each minute after that. That means a car starting out at 70 degrees can become a 104-degree oven in just 30 minutes. Also, don't overwork your Pommie. Nice weather beckons, calling us outside for some quality time and fun, but a brisk walk or a spirited game of fetch can turn to overexertion, which can cause heatstroke for your dog. How Hard Is Caring for a Pomeranian?